...organized by the National Geographic Society... in co-operation with the Egyptian Supreme Council of Antiquitie... an explanatory inscription observes [that] the word pharaoh comes from a Hebrew word in the Bible referring to a ruler in Egypt. This word, in turn, is derived from an Egyptian phrase, per aa, which means great house, or royal palace, said the exhibit’s cu­rator, David Silverman, a professor of near eastern languages and civilizations at the University of Pennsylvania. 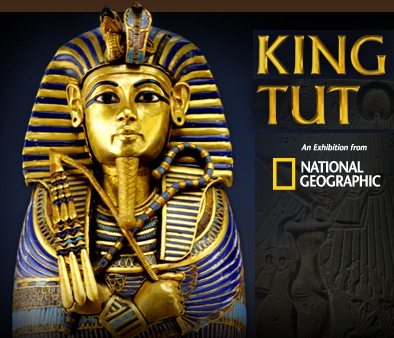 Because National Geographic is biased against the historicity of the Bible, therefore, their conclusion on the etymology of the title "Pharaoh" is like testimony contrary to interest, and is therefore especially weighty. Of course intense bias against Scripture is shared by the culture at large and among most modern scholarship, so not surprisingly, the Wikipedia entry and online etymology incorrectly claim a Greek origin for the term and thereby obscure its Hebrew origin. "Pharaoh was the name given by Hebrew writers to the king of Egypt. ... It has been pretended that [the word Pharaoh] is a corruption of the Egyptian pa-oura, which is said to mean "the king". But ur, or oura, simply means a chief, or headman, and has not yet been found applied to any monarch. ...no word, term, or title resembling Pharaoh has yet been found upon any Egyptian monument applied to any king." 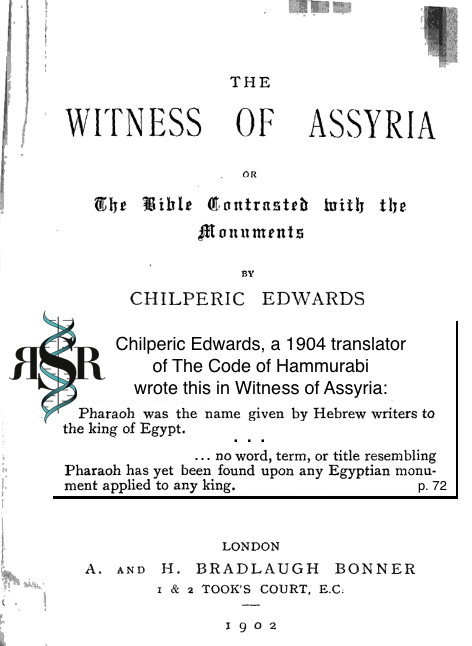 Though writing more than a century ago, Edwards' observation stands the test of time in the point that Pharaoh was not a traditional term for the King of Egypt. (For examples of Egypt's gradual adoption of the term, see Wikipedia's Etymology section, and for questions of date ranges in that section consider our observation over at rsr.org/egypt#inconsistencies-in-timelines.) Regarding Edwards, we reference him for his succinct statement that "Pharaoh" is not an Egyptian but a Hebrew word. However, he was not keen on the idea that the Hebrew word "Pharaoh" had derived from the Egyptian pr-aA, "great house". Regardless though of his opinion on the etymology of the Hebrew word, the significance is that he recognizes that "Pharaoh" is not an Egyptian word, and that it was not an Egyptian term for their king. Why is this important? Almost all secular scholars join with those who reject the historical basis for the Exodus in discounting any significant role for the Jews in ancient Egypt. However, consider that the Hebrews gave to the ancient world, and eventually even to the ancient Egyptians themselves, the term Pharaoh. Just as "White House" refers to the leader of the United States, "Today the White House proposed...", so too because of the Jews, the entire world uses the word Pharaoh, from the King's palace, pr-aA, as a metaphor for the King of Egypt, because of the Hebrews. 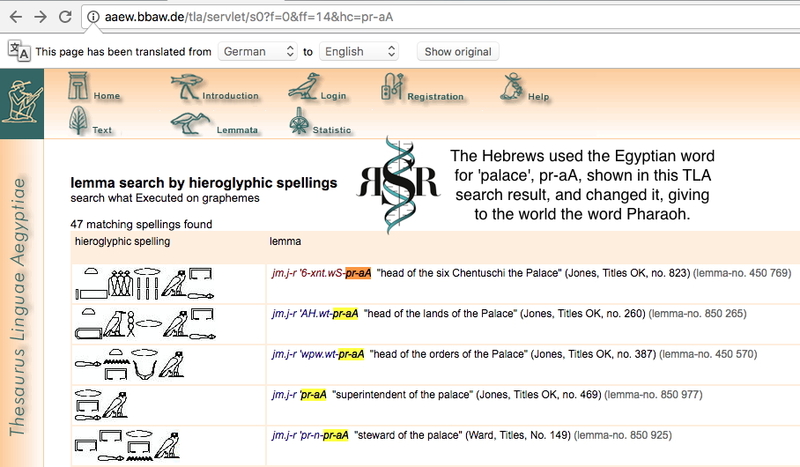 * Alan Gardiner and TLA Transliteration of Palace: The screenshot below (click to enlarge it) is from the powerful web resource Thesaurus Linguae Aegyptiae. See displayed both the hieroglyphics and the English transliteration pr-aA for the Egyptian word for "palace". 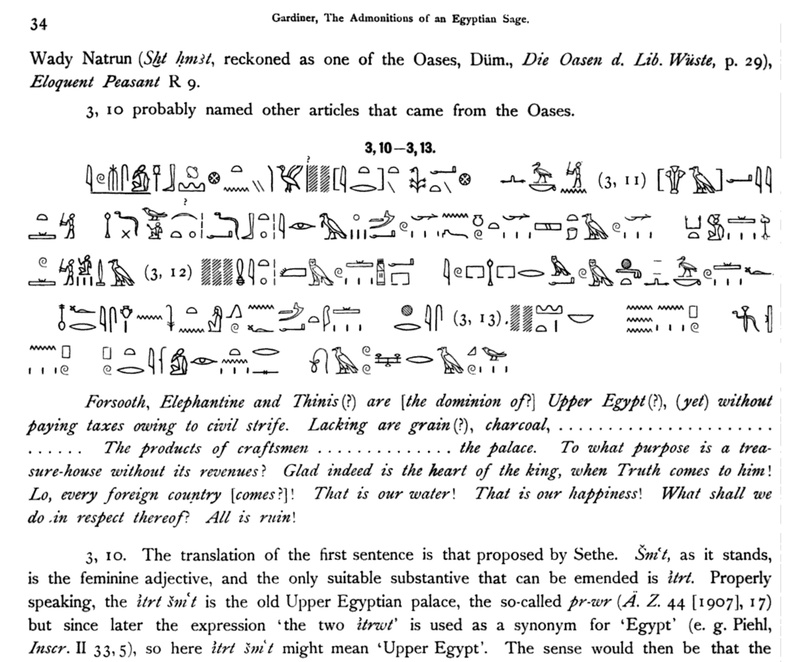 Likewise, see the inset just above from page 34 (click for more) of the 1909 Ipuwer translation by Alan Gardiner, misnamed The Admonitions of an Egyptian Sage. The transliteration for "palace" there, some few hundred years after Joseph (by an Exodus-based chronology) is pr-wr. * Whence Comes Pharaoh: Interestingly, the title Pharaoh is Jewish while the name Moses is Egyptian. And the world speaks the particular word Pharaoh, not from the Egyptian language, but from the Hebrew and because of the Bible which uses the word more than 200 times. This is a tiny example of the observation that all of human history, language, and knowledge is comprehensible only in light of God's Word. * The Jews likely gave the word "Goshen" to Egypt: As with pharaoh, another word that appears to have come from the Jews is the Hebrew word Goshen, which refers to a fertile region of the Nile delta. At least by the time of Egypt's 26th dynasty (664 - 525 B.C. ), Egyptians themselves called this area Gesem, which is the Septuagint’s Greek translation of Goshen. This word seems to "only [have] meaning through Hebrew, as if it were a word meaningful only to the Hebrews who settled there". The Septuagint translation suggests the meaning "'cultivated'—comparing the Arabic root j-š-m, 'to labor.'" With the Jews giving to the world the words Pharaoh and Goshen, consider then how great the significance if it turned out that the Egyptian name Ramses also originated with them. * What If the Name Ramses Had a Similar Origin? Realizing, by the material above, the Hebrew origins for the words pharaoh and Goshen, though previously unthinkable, might another important Egyptian name have originated with Joseph? The name Ramses means born of Ra, the sun god. Early in Egypt's history, by the Fifth Dynasty (~2500 - 2350 B.C.) the Pharaoh was said to be the son of Ra. Yet for a thousand years, no city, region, or king was named Ramses. Joseph's initial years in Egypt led to his exaltation by Pharaoh. Easily he could then have described to his family this land by using an Egyptian term, "of him who was born of Ra", that is, the "the land of Rameses" (Gen. 47:11). That same chapter, Genesis 47, explains that even "the land became Pharaoh’s". So in the telling of those events, Egypt really had become "the land of Rameses". So, did Joseph coin that term? If the Jews were the ones who popularized this name, then the references to Ramses in Genesis 47:11 and Exodus 1:11 would not even be anachronisms. For then, as with Goshen and, stunningly, even the term Pharaoh itself, the Jews would be the source of the name Ramses too. Consider also the extensive archaeological evidence that a Semite people built and dwelt in Egypt's large delta city of Avaris, which city has been excavated from beneath the city of Ramses! Thus the New Kingdom's Ramses Dynasty may have taken it's name (like da Vinci, etc. ), from the place of its origin, rather than the reverse. If ever established, of course, this would wreak havoc among Moses' critics. 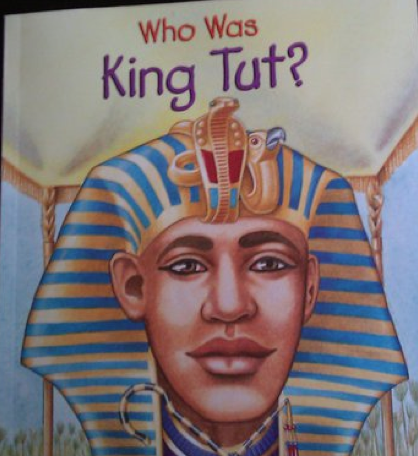 * Baracktut Obamankhamun: Oh yeah, and there was just something about the drawing of Tutankhamun (see the cover, above, of the Edwards and Kelley book). That image reminded us, and everyone else in the museum gift shop, of Obamankhamun more so than of any teenage pharaoh. Consider that in November 2007, the Secretary General of the Egyptian Supreme Council of Antiquities, Zahi Hawass asserted in Ancient Egypt Magazine, that none of the popular facial reconstruction efforts resulted in anything resembling the real Tut and that in his opinion the most accurate representation of the boy king is the mask from his tomb (see left, and compare that with the above book cover drawing, which we're affectionately calling Baracktut). * New Military Drone the Gorgon Stare: Bob discusses the next generation unmanned aerial vehicle that the U.S. Air Force is about to deploy. Meanwhile, Osama bin Sittin in a basement on the Pakistan border with Afghanistan. Still. (Since Tora Bora, Bob has been saying that undoubtedly bin Laden hiding out in Pakistan). And the media has a hard time figuring out how to care about Christians who are killed by Muslims, including those Egyptian Copts murdered by terrorists on New Year's Eve. Finally, what makes a criminal a terrorist rather than just a garden-variety murderer? See kgov.com/terror. Today’s Resource: Have you browsed through our Science Department in the KGOV Store? Check out especially Walt Brown’s In the Beginning and Bob strongly recommends that you subscribe to CMI’s tremendous Creation magazine!